These conversations, and the confusion they represent, have inspired me to help corporates understand and plan for this transition. To that end, I created a model that explains what digital transformation is all about. You can see a deep dive into that model in a white paper I created here: https://aka.ms/Gr2feg, but first here’s a primer covering the basics of digital transition. So, what is a digital transformed company anyway? Is digital transformation about processes, or is it all about building digital services and products? These two words – digital transformation – are uniting the whole business world these days, but the confusion about what digital transformation actually means is a fascinating study in perception, and human understanding. Two words; a hundred interpretations. Here’s the problem: Before you can start to build and implement a sustainable transformation strategy, you first need to fully understand what digital transformation is, and the multiple layers it’s composed of. The whole team must have a common understanding of what’s involved. If that’s not already enough confusion to cope with, it’s getting much worse these days: AI is fast becoming the new digital transformation. Corporates want to jump on the AI train, but how does that integrate with digital transformation? So, my take away of all these real-world observations is this: We’re all in desperate need of a simple model that makes it crystal-clear for everyone in and outside an organization what the different layers of digital transformation are – and how do we bring all this together with all the AI stuff that’s looming on the horizon. Of course, it’s not easy to map out something as complex as restructuring an entire company, but I have nevertheless tried to create a blueprint that corporates can follow. For my model, I chose a simple geometric shape – a pyramid – that mirrors the organizational logic of digital transformation. Why a pyramid? Because digital and AI transformations are composed of layers of change that build from a solid foundation to more focused, and precise modifications. Base – Backend Layer: This is the most fundamental and important layer and it has three components: organization, data, and processes. The first component, organization, includes the systemic and structural changes that must happen for a company to truly take advantage of the digital economy. It demands that businesses change their mindset and their culture. Digital transformation is a huge change management project – and this is what most corporates forget or even deny. A digital transformation will only be fruitful if it’s based on an organization, and culture with a fully digital DNA. Data, the second component, requires that companies incorporate data as a lake of centralized knowledge, and the backbone of all corporate IT, product, and strategy measures. Finally, companies must transform their processes to account for a digital world. This includes things like digitizing services such as CRM or completing the transition from paper to digital tools, and the cloud amongst others. Body – Customer Connector: This layer is where your business meets your customer and includes distribution and marketing. It’s all about the question: How can we reach customers via digital channels and tools? Many businesses are tempted to start here with their digital transformation efforts (e.g. implementing an online shop or selling via Amazon), but your business will suffer if you don’t build these efforts on top of a more solid base. 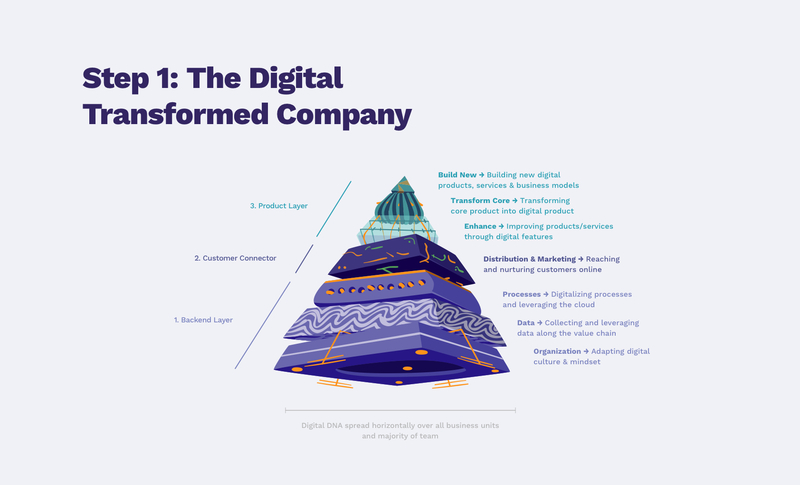 Pinnacle – Product Layer: Here’s where digital transformation can help you refine your product into a sharp and well-polished digital offering. This comes to fruition either through transforming the core of the product and/or by creating something new for the digital world. What do these concepts look like in reality? Let’s start with the foundation. An example of this could include creating processes and tools (e.g. CRM) to take advantage of the data generated by the business. At the customer connector level, this includes things such as your online presence or store, as well as digital tools that your customers can use to communicate with you. Digital transformation at the product level might include something as simple as adding a digital component to a traditional product – for instance, a touch panel on a refrigerator. Even though many companies are still at the earliest stages of digital transformation, they are already looking ahead towards the next looming challenge: AI. Here, it must be said, that companies can’t simply leap ahead towards an AI transformation, without completing the digital switch first. It’s like trying to skip to the end of a video game and take on the final boss, without building up the skills, health, and tools needed to handle the job. However, if a company is truly ready to tackle the challenge of AI, it can be approached with a similar structure. The AI transformation involves the same three layers of the pyramid – Backend, Customer Connector, and Product Layer. Of course, an AI transformation presents its own unique demands and challenges. Now, companies not only need to collect the data they generate, they need to start processing it to feed AI algorithms. They need to leverage AI in their interaction with customers and most importantly, build products and services that are built around AI capabilities. Apart from the above, there’s one other important element at play when you think of digital or AI transformation. In a non-transformed company, there are generally few people with real, native digital/AI “DNA” in their professional capabilities and experience. The transformation load is very much on the shoulders of these people who often act as a task force helping different, vertical business units in their transformation. However, in a fully transformed company, the majority of the employees should have digital/AI DNA to ensure the knowledge and experience is spread horizontally over the company and its units. Every leader faced with a difficult challenge wants to find ways to tackle that problem as quickly as possible. For corporates, that can often take the form of engaging with startups. This Startup Flywheel, as I call it, can quickly inject needed digital expertise and IP, and help a company accelerate its digital or AI transformation. However, this is in no way a substitute for a real ground up transformation. The most important thing that corporates need to know about these transformations is the importance of starting from the foundation of your business. It’s easy for executives to tackle this problem piecemeal, either by working on their own specific part of the business or by integrating individual digital solutions. However, adding digital tools, services, or other technologies on top of an outdated organizational foundation and strategy is a recipe for failure. It may seem like a daunting task: rebuilding the core of your business and integrating new and potentially foreign ideas and practices. But much like the real pyramids, this transformation can be accomplished step by step, brick by brick. The most work is required at the beginning, to build a large and strong foundation. But as you climb to the top, the work will become easier and the rewards all the more dazzling.